Problems and priorities for critically-ill children in limited-resource settings. Pediatric Critical Care Medicine, Pediatric Emergency Medicine, and aspects of Neonatology. Implementation science and leadership skills geared towards optimizing local health care systems for critically ill children in Sub-Saharan Africa. Develop and implement a locally sustainable fellowship program in pediatric emergency and critical care medicine in Kenya geared towards the needs of pediatricians in sub-Saharan Africa. Support basic pediatric critical and emergency care short courses for nurses and doctors in sub-Saharan Africa. Develop and implement a low-technology high fidelity simulation program for pediatric nursing and physician staff in Kenya caring for critically ill and injured patients. Develop educational materials focused on pediatric emergency and critical care in low-resource settings. FPECC is a two-year fellowship in Pediatric Emergency and Critical Care geared towards pediatricians from Sub-Saharan Africa. Training occurs at University of Nairobi/ Kenyatta National Hospital in Nairobi and at A.I.C. Kijabe Hospital in rural Kenya. Fellows are getting trained in management of acutely and critically-ill children in the public and private, urban and rural, tertiary care and district level health care sectors which are all relevant to practitioners in sub-Saharan Africa. FPECC training and fellow supervision is provided by a combination of local Kenyan and visiting experts in Pediatric Emergency and Pediatric Critical Care. The first class of PECC fellows was enrolled in January 2019. 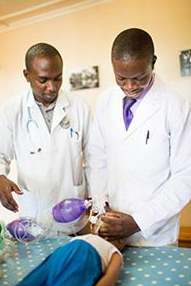 The curriculum for the Fellowship in Pediatric Emergency and Critical Care was developed by Pediatric Emergency, Pediatric Critical Care, Pediatric Anesthesia, Pediatric Endocrinology, and Pediatric Pulmonary subspecialists from University of Nairobi, University of Washington/ Seattle Children’s, A.I.C. Kijabe Hospital and Gertrude’s Children’s Hospital. The curriculum has been evaluated and discussed with representatives from the Kenyan Ministry of Health and the Kenyan Pediatrics Association and was approved by the University of Nairobi as the accrediting institution. This is the first program of this kind in sub-Saharan Africa. All PECC team members are certified instructors in Emergency Triage and Assessment + (ETAT+), Pediatric Fundamentals Critical Care Support (PFCCS) or Pediatric Advanced Life Support (PALS) and actively involved in increasing pediatric acute and critical care capacity in sub-Saharan Africa.